While everyone is busy preparing for the coming winter, two girls wander away from their camp, following a path of strange, beautiful stones. Each stone is lovelier than the last, and the trail leads them farther and farther away from camp. 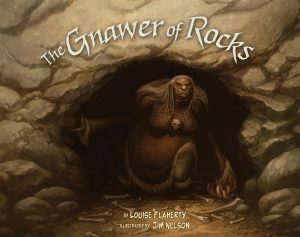 But what starts out as a peaceful afternoon on the tundra quickly turns dangerous when the girls find themselves trapped in the cave of Mangittatuarjuk—the Gnawer of Rocks! Based on a traditional Inuit story, this graphic novel introduces readers to a dark and twisted creature that haunts the Arctic landscape and preys on unsuspecting children . . . .